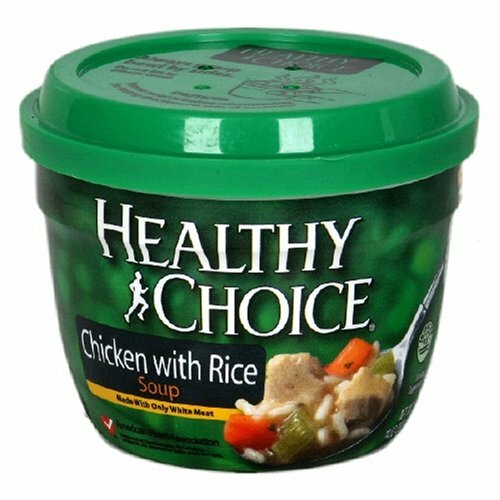 Healthy Choice soups are not my first choice when it comes to ready-made soups. These are convenient to take to work, though, so I often pair one of these with some crackers or a bag of tortilla chips to round-out a meal. They're easy to open and heat. The Chicken with Rice Soup is a little light on the rice, however. This is not a hearty meal. There's much more broth than chicken, rice, or vegetables in the package. The flavor is light, and especially not as salty as other ready-made soups. The chicken, vegetables and the rice are of decent quality, though, and this soup almost always seems "fresh" after I heat it -- it doesn't seem like it's from a can or container. I don't normally write reviews for products, but I have to say that I took a chance on buying two boxes of these due to price. I was very shocked, and happy, with my first experience with this soup. PROs: REAL white meat, veggies, low salt broth, great flavor. CONs: If you like salt don't buy this soup. This soup needs more rice in it to make it equal with the Chicken Noodle. This is a big oversight by Con Agra. What would it take to add some more rice? I bought these during a promotion for $1.13 per container, which you will never find anywhere but Amazon. When you think of what you could spend on junk for snacks at work, this is really quite a bargain. My own "research" tells me that soup helps cut the munchies. Bring a couple of them to work, and you just might be able to stay out of the cookie jar or vending machine. Of course it's not the same as home-made, but as a close second, Healthy Choice has the added benefit of great packaging that allows you to stockpile for those days when you've forgotten to bring other food and can't get out to pick something up.